Home / Blues / Blues Guitar Lesson – Killer Blues Licks with These 3 Tricks! 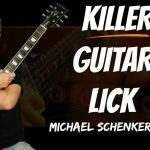 Blues Guitar Lesson: Killer Blues Licks with These 3 Tricks! In this lesson you’ll learn 3 simple tricks you can use for killer blues licks and better blues guitar solos. Let’s dive in! 0:40 Everything in this blues guitar lesson is shown in the key of G and uses these blues scale patterns shown. All the blues licks and ideas will work great over a 12 bar blues in the key of G but make sure you move it to other keys as well. If there’s one must know string bend in blues guitar…it’s this! It’s up at the 8th fret in the key of G and comes from the top part of the sliding blues scale. You’ll recognise it from the kind of licks I play here. It’s versatile and works at lots of different points in the 12 bar blues. 3:08 Practice using this bend and it will start to come out naturally in your blues licks and solos. This awesome little blues slide will give your solos some ‘grease’! It comes from the 1st pattern of the G blues scale. I use my 3rd finger to play it. Find ways to ‘get in’ to the lick and ways to ‘get out’ of it and practice mixing it in amongst all the blues licks and tricks you do already. Essential bending technique for awesome blues bends! This will make a huge difference to your blues licks and solos because we use bends all the time when we play blues solos. Use your picking hand to ‘cut off’ the bend before you release it rather than getting a ‘let down’ sound all the time (even when you don’t want it). Also experiment with letting the bend so you do hear it. A mixture of these different bending techniques will make your blues solos and blues licks more interesting. THEN JOIN THOUSAND OF OTHER GUITAR PLAYERS IN MY FREE ONLINE COMMUNITY… AND GRAB A POWERPACK OF EXCLUSIVE ‘MEMBERS ONLY’ LESSONS!